Do YOU Believe in Magic?... We DO!!!! Congrats to Our first One Show Grand!!!! Congratulations to GC RW Emau's Cirque De Soleil of Hajja!!!! 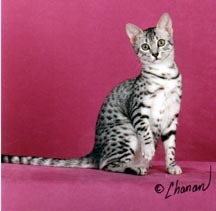 Purr, Atoly's littermate granded in style near the end of the 1999/2000 season as well! 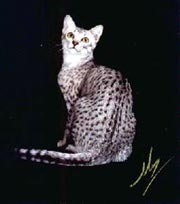 In doing so she earned herself the honor not only of Grand Champion, but second Best Egyptian Mau for Region 1 - right behind Aunt Future! The 2000/2001Season started with a bang! 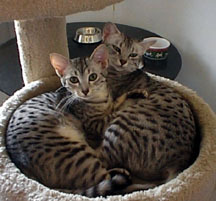 Littermates GC Emau's Cirque De Soleil of Hajja (Purr), owned by renowned Mau breeder Jill Archibald and partner Karen Bishop and GP Emau's Do You Believe In Magic (Atoly), Owned by Pat Summers, stated out the month of May as new grands and positively on fire - first list out, Both Purr and Atoly were nationally ranked in top 15! Then Purr took a break for babies and Atoly decided that a summer coat did not need spots, so the spotlight moved on - at least momentarily! Then in the fall the coat was back and Atoly started to climb again... Atoly ended up 22nd Best cat in premiership, right now he is right behind half brother in regional rankings. Purr also re-debuted in November at the International... Babies were grown and she was ready to strut her stuff. She ended the season a Regional Winner in NAR, NAR Best of Breed and National 2nd Best of breed! GP RW Emau's One-Of-A Kind! Not only a one SHOW, but a one DAY GRAND! Uno knows how to impress the judges!!! The Little Man He's as Sweet as he looks!! GP Emau's Chiaroscuro - a lady among the big boys! GC BW Emau's Kyrie	& GC Emau's Pyramid Scheme! Perhaps most exciting of all is that there are stars on the horizon that look to be shining very bright indeed!!! 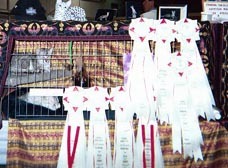 Emau's Amauzing Grace is my latest show kitten... She debuted at the International as a 4 month old and amazed me with a final in her very first ring. 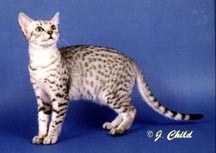 She ended up 3rd Best Egyptian Mau kitten despite being utterly terrified by the crowds and the commotion of the huge convention center...Grace is a gentle soul with the face of an angel... she gains confidence with every show and has been doing quite well. Kansas City in the year 2000.... an unbelievable three days that could not have been scripted with more melodrama or emotion.... When we packed the car for the 18 hour drive we were loaded to the Gills... 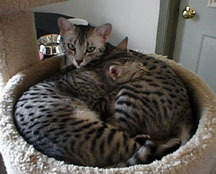 In the car we had 8 incredible Maus including my Pounce and believe you me, with such precious cargo, we drove CAREFULLY! The entire weekend seemed destined to be the show finale that Pounce and I never had... Incredilbe emotional for me and indescribably sweet. Although she had not shown since the end of the last season and, in fact was still kind of nursing her babies, Pounce took the long trip and re-introduction back to show rright in stride... I'll never forget taking her to the first ring... I had already put Kyrie and Pyramid up and all the other Maus in Championship were already up as well - So when I went back to get her I was all alone (thank goodness!) I took her out to groom her and she looked around the showhall with her startling green eyes as if she owned it and then settled in my arms in her old show pose; like Cleopatra lounging on a dias - stretched from tip to stern... As I took that long walk thorugh the huge hall to hte ring I did so with tears of emotion straming down my face... It was just so right... Can't tell you how glad I was that everyone was already up at the ring watching the beginning of the class and thank goodness at the International we enter the rings from the back - gave me a chance to compose myself... She took BOB in that ring which was a harbinger of the way things were to go for her all weekend long. It was to be "her" weekend. By the end of the day she was actually not only highest scoring Mau, but 4th highest scoring SH cat in show thanks to two finals including a 3rd Best cat!!! Talk about an unbelievable re-debut! 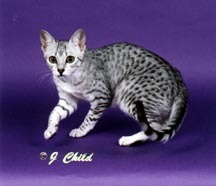 It was a dream come true for me... She ended up 26th highest scoring cat in show and a convincing Best Mau in Championship and I was dancing for joy... Perhaps even more amazing was roomates Kyrie and Pyramid finished 1, 2 behind her, so we actually ended up taking all three Championship awards! Judges even got them in the right order! 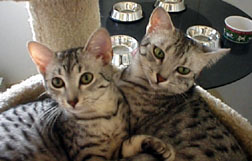 The rest of the crew did us proud as well - Uno ended up Best Mau in Premiership against some lovely grands and took home a coveted 3rd Best cat final and Osiris and Grace ended up 2nd and 3rd Best Mau kittens. 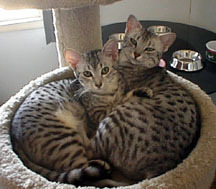 Impressively, both finalled in a class of over 300 kittens!! Not a bad debut for little Grace who was just 4 months and a minute... Quite an incredible show... Had hoped to have a cat good enough to take Breed at the International, but had never imagined that I'd have a cat good enough to FINAL there against the best of the best... so to have FOUR cats final at the same International was beyond my wildest imaginings... Sure made that all night drive home Sunday easier to take!